Happy Tuesday, loves! The first official day of Fall is this Friday! Can you believe it!? I am so excited and ready for it! I have already taken the majority of my summer clothes out of my closet and replaced them with my fall wardrobe! So exciting! 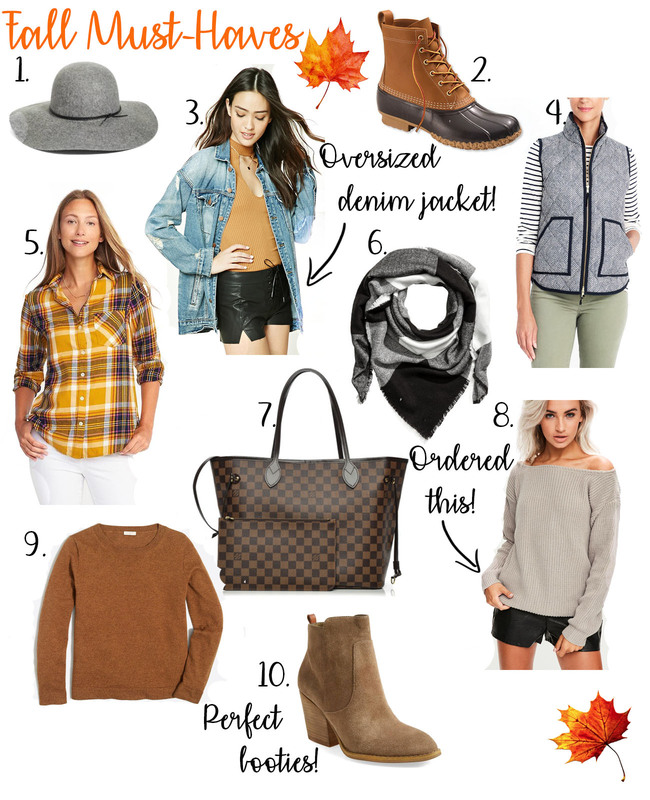 Below I am linking some things I have that I love for Fall, along with some things I am wishing I had! Enjoy! 1. Wool Floppy Hat- I love a cute floppy hat to wear during the Fall & Winter months! This one is perfect, at a great price point and also comes in 3 other colors-all so cute! 2. Duck Boots- I LOVE my LL Beans! They are awesome quality and they are the perfect little boot for Fall! Make sure to check out the sizing recommendations! 3. Oversized Distressed Denim Jacket- The oversized distressed denim jacket trend is becoming one of my favorites for fall! Love this one from F21! 4. Quilted Puffer Vest- A classic! This vest is a must-have for sure! I wear mine all the time! 5. A Classic Flannel- Old Navy Flannels are my favorite! I have so many in my closet! I love the colors in this one! 6. Scarf- I love a good chunky scarf when the temps start dropping! H&M has so many cute ones at such good prices! 7. Louis Vuitton Neverfull MM- I LOVE this color for Fall! 8. Off Shoulder Sweater- I ordered this and love it! The quality is really good for the price! I do wish I would have gotten an M/L instead of a S/M for a more oversized fit! 9. Cotton-Wool Teddie Sweater- Another classic! I love J Crews sweaters! This one comes in so many other colors, too! 10. Block Heel Bootie- How cute are these!? Seriously the perfect fall bootie, hands down!